What can be said about the Denver Outlaws that hasn’t been said already? Ok, don’t answer that question because there are a whole host of unknowns heading into the 2015 campaign. On-field fortunes have been increasing for the Outlaws in recent years. After years of playoff disappointments, most notoriously after their undefeated 2013 regular season, they finally raised the Steinfeld Trophy in triumph last year. The harbinger of change is constant in Major League Lacrosse, and while it would be nice to keep the band together for years on end everyone knows that such a thing is impossible in the modern sports environment. The 2014 regular season started off the way like most of 2013 with five straight wins. The Outlaws didn’t taste defeat until June in 2014, snapping a 25 game regular season winning streak. The home loss to the Boston Cannons on July 4th marked the first home loss for the Outlaws since June 2, 2012, a streak of 15 games. All told the Outlaws dropped five contests during the regular season, finishing second in the tables with a 9-5 record, one game behind Rochester at 10-4. The top two teams ultimately met in the final in Kennesaw, Georgia, with the Outlaws come-from-behind 12-11 victory. 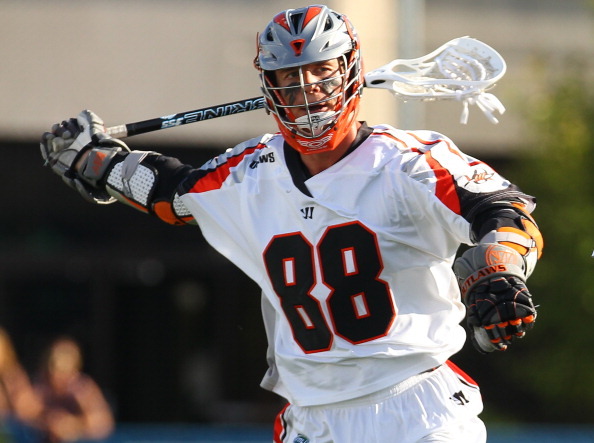 Fun fact: In 11 MLL seasons, John Grant, Jr. has played in 5 championship games and won every time. As mentioned above, change is a constant in professional sports. The Outlaws return most of their primary contributors from last year’s championship run, but there remain some major holes to fill. Hands down the most significant subtraction for the Outlaws accompanied the retirement of world-class defenseman Lee Zink. Denver also traded away the rights to electric attackman Curtis Dickson, but the likelihood of Dickson returning to MLL seem to be marginal at best. With a gaping hole to fill in the team’s back line, the Outlaws added a number of defensive options in the off-season. These included a trade for former Ohio Machine, Max Schmidt, and selecting Tim Henderson in the supplemental draft. Other key additions for the Outlaws in 2015 include a second faceoff specialist in Geoff Snider, and a second goalie in Dillon Ward. These things are impossible to predict and that’s why they play the games. Don’t be too shocked (or too worried) if the Outlaws hit a few bumps early in the season. Taking a look at the roster notes above one thing that stands out is that eight of the team’s 25 man active roster are playing in the NLL right now. This doesn’t mean that all eight will be unavailable for the same period of time because a lot depends on which teams make the NLL playoffs and how far they go, but with Grant, Holding, Ward, Flint, and Noble all playing for the Colorado Mammoth, a deep run by the local NLL team could put some major Outlaws contributors on ice for a large chunk of the season. The opening half of the season won’t be a walk in the park either. Three of the seven games through May are against playoff teams from 2014 (at Rochester, and home-and-home with Ohio), not to mention a Chesapeake squad that should rebound from a down year last season. When everyone on the active roster is in the lineup Denver’s attack unit is lethal. John Grant, Eric Law, and Chris Bocklet carved up opposing offenses last year, and there’s little reason to expect anything less. However, of the eight attackmen on the roster three are NLL commits; Grant, Greer, and Flint. If you look closer the position designations at attack make very little sense and it makes one wonder if some players were simply listed without any forethought or if these listings are a sign of change (or more likely, the league requires a certain number of players per position and these are just semantics). Greer is a natural attackman, but ran out of the box last year for the most part. Flint was an All-American midfielder and there doesn’t seem to be any reason to move him from that position. Harbeson played midfield at UVA and was a solid short stick defensive midfielder. The Brothers Bocklet – Mike and Chris should be interesting to watch if they get some run time together. Do they have that intuitive chemistry to instantly click at the MLL level? Greg Melaugh was acquired by the Outlaws on April 1st. Given his last name and the date of the transaction I thought it was an April Fool’s prank. Apparently not, but this move has created intrigue and I, for one, am interested to see what Mr. Melaugh can do. Denver’s midfield unit looks pretty solid. There aren’t any major subtractions from last year. Terry Kimener went to Charlotte in the Geoff Snider deal, and while I expected to see Colin Dunster step in to fill Kimener’s role it looks like Noah Molnar will have first crack at the opportunity. Denver also added former Albany and Syracuse midfielder Luke Cometti who scored 34 goals and 9 assists as a senior for the Orange. He could add some scoring punch to an already potent offensive midfield unit alongside Drew Snider and Jeremy Sieverts. It looks like Anthony Kelly is back for another campaign in Denver. Given his lower body injuries in the past and the grind comes with being a faceoff specialist at the MLL level I thought Kelly might be a candidate for hanging ‘em up after the championship win last year. Clearly, my armchair quarterbacking missed the mark on that one. The addition of Geoff Snider is huge here, assuming he reports to the team, which is always a concern for Canadian players. If you watched Team Canada play at the FIL at all last summer you saw that Snider is still a force to be reckoned with and his addition to the Outlaws gives them one of the best one-two faceoff punches in the league. In terms of faceoff depth only New York, with Greg Gurenlian and Jerry Ragonese, is comparable. I’ve addressed the questions surrounding the Outlaws’ defensive corps in this space before, but for the sake of coherence I’ll touch on it again. Losing Lee Zink is huge; he was the heart of the defense. This is to take nothing away from the men flanking his sides though. Dillon Roy stepped up his game in a big way last year and Chris O’Dougherty is extremely underappreciated for what he’s able to do on the field. There are several options for the third slot though. Ken Clausen, a four time All-American at Virginia looks to be healthy for the first time in years, and the timing couldn’t be better. If he can regain the form that made him a stud in college it would go a long way toward bolstering Denver’s backline. I thought that Tim Henderson would be the frontrunner for the starting spot, but he’s starting the season on the military inactive list. Until Henderson can come in and compete the job is likely between Clausen and Max Schmidt, who came over to the Outlaws from Ohio via a trade at the 2015 college draft. In some ways this is almost a mirror image of the faceoff section, but basically replaced Anthony Kelly with Jesse Schwartzman and Geoff Snider with Dillon Ward. Jesse Schwartzman is the man in Denver until further notice. But that doesn’t mean he can’t be spelled on occasion. Charlie Cipriano did a great job of that last year, but he was traded to Florida (along with Curtis Dickson’s rights) for Dillon Ward. But if Ward reports (I’m getting tired of having to use this caveat with so many NLL players, but it’s the hand we’ve been dealt) Denver will have the best goalie tandem in the league. Two main things jump out for the first half of the season. One is the play of the attack. How will Chris Bocklet and Eric Law adapt to new line mates early on? Who is going to play what role? Bocklet has the outside shot, Law can carry and distribute or initiate on his own. What’s the right combo for the left side in this equation? The other is obviously at the other end of the field with the defense. The question isn’t if they can gel, they have to in order to be successful, but how quickly can the unit play as a unit? A bonus item: Rookie play – The Outlaws got richer at the collegiate draft. As these players start to trickle into the lineup it will be interesting to see who makes the leap right away. Dan Taylor and Wesley Berg are both capable of stepping right into the Outlaws’ line up and contributing. The same goes for Nikko Pontrello.